Montes handles all varieties of snappers; red, yellow-tails, lings, parrot, silks, tile fish, kingfish and whiting, We handle all varieties of seafood; Pollack, grey sole, spanish mackerel, sea bass, porgies, all fish; fresh and frozen. Montes Seafood Emporium has been in business since 1992, started by brothers Richard and Jack Montelbano. 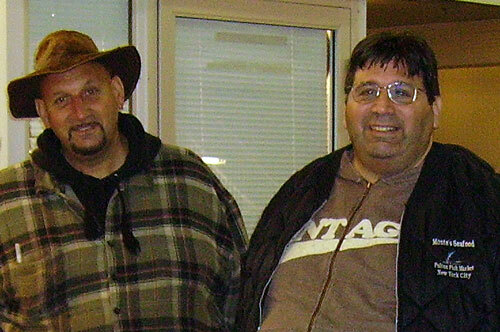 Richie (pictured on the right) and Jack (pictured on the left) haved have been in the seafood business for over 35 years. They operated a small wholesale and retail fish store out of Copiague, New York. Very much selling just Long Island fish such as stripped bass, whiting, tile fish, bluefish, flounder and fluke; getting fish straight from the boats. Eventually the Montelbano brothers progressed to the Fulton Fish Market, where they operated a fresh fish trucking company till finally they put their collective experiences together and opened Montes Seafood Emporium. After more than a decade in the business, our experienced salesmen are experts in their fields, offering you the very best wholesale seafood at prices that are sure to please.